Chop up your chicken into bite sized pieces, removing the big chunks of fat and trying to keep them as uniform as possible. Add the olive oil, adobo seasoning, amarillo seasoning, salt, and pepper. Marinade overnight in the fridge. Soak you skewers in a container of water overnight. Wash and chop your peppers into separate containers, trying to keep them as uniform as possible. Bake at 450 for 10 minutes, then turn them and bake for another 10 minutes. Cut open the larger pieces of chicken to check doneness. 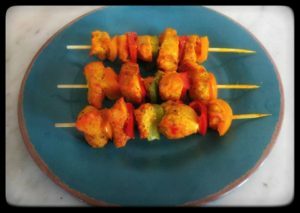 Makes approximately 23 skewers, with bell peppers left over. There are about 0.6 net carbs per skewer.